OMAHA, NE. March 26 – Visit Omaha is going to the NCAA® Final Four® by train...actually, two trains. As part of its 2019 “52 Weekends” advertising campaign promoting Omaha as a year-round destination, Visit Omaha once again wrapped the Minneapolis Metro Blue Line and partially wrapped the Metro Green Line with train-sized invitations to plan a weekend getaway to Omaha. In 2018, Visit Omaha wrapped one of the trains to take advantage of the fact that Super Bowl LII was in Minneapolis. The train ads run through April. Metro Transit in Minneapolis estimates the two trains will be seen more than 8.6 million times. In addition to the eye-catching photography on the outside, this year the interior of one train is also filled with ads promoting the city&apos;s attractions, craft brew scene, and the NCAA® Men&apos;s College World Series®. The Metro Blue line runs from Mall of America to U.S. Bank Stadium, the view site where the Final Four® and Championship games will be played. The Metro Green Line runs between St. Paul and the downtown sports district. Link to train ad photos. Every year the city of Omaha welcomes 12.3 million visitors. Those visitors come to the city for a getaway, to attend a convention, a sporting event, or to conduct business. While here, visitors spend $1.2 billion every year eating, shopping, enjoying attractions, and staying in local hotels. Visitor spending provides many of the amenities local families enjoy. For more information about What Tourism Looks Like in Omaha, go to VisitOmaha.com/Industry. 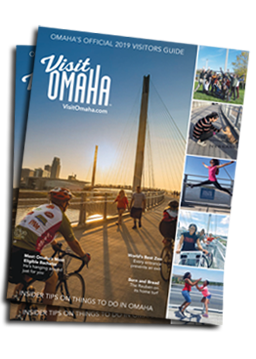 Visit Omaha is the official tourism authority for the City of Omaha and Douglas County, also known as the Omaha Convention & Visitors Bureau.